So... turns out Giving Tuesday is a thing. I didn't really realize it until today, which conveniently happened to be Giving Tuesday. That's not to say I hadn't heard of it before - I remember articles about it when it was created in 2012 - but I was truly stunned by how many colleges, non-profits, etc. jumped on the Giving Tuesday bandwagon today, taking to social media in droves to solicit donations. Because this is such a new thing, I thought it would be a good idea to do a roundup of several different examples of what colleges did for Giving Tuesday, so you can get a feel for what schools out there are doing. Colorado College posted a gallery of photos on its Facebook page of students holding up thank you messages that were written on a white board. This is a tried-and-true tactic of getting some great engagement on social media for giving-related content (which is not an easy thing to do). Fresh faces, genuine appreciation, and heartfelt thanks... it all adds up into an effective stewardship and awareness piece. Special props on the great backdrop and Giving Tuesday poster prominently featured. Trinity University created a special app on its Facebook page to highlight this video and include a link to its giving page. This video is a motion graphic that explains why every gift makes a difference, even if its small. What I thought was particularly interesting about this one is that it took an angle I haven't seen a lot of: This school has high tuition and a huge endowment... why does it need a small gift from a recent alumni? In today's climate of skepticism about higher ed and its value, I thought that was a smart take. Trinity has been ranked #1 in the Western Region by U.S. News for many, many years in a row (I know, because UP is always in the Top 10 but never up at the top with Trinity), and it really stood out to me that one of the top reasons they gave for why gifts matter is that it factors into rankings. Appealing to school pride and a competitive spirit of staying at the top of the heap... I love it! This example from Occidental College is all about fun and charm. It's an obvious play on the inanity that is Black Friday, and it was pretty cute to see the students clearly having a good time while they pretended to be camping out and rushing to donate. The video itself isn't a direct ask, but when posted on social media a link to the online giving page was included. It's always nice to use student energy and creativity in videos for development purposes, because really, providing opportunities for young people is the main reason people give back. So what do you do when you don't have any plan at all for Giving Tuesday, but then realize that everyone else is posting about it so you really should too? Well, you just slap up a link to the online giving page and try to make it look as snazzy as possible. Anyway, I wanted to highlight the importance of the link image for things like this. I wrote a post a few weeks ago about optimizing link images, and it's worth taking a look at it if you haven't yet experimented with uploading a custom link image. This is SO worth doing, especially when you want to use the image itself as a call to action. 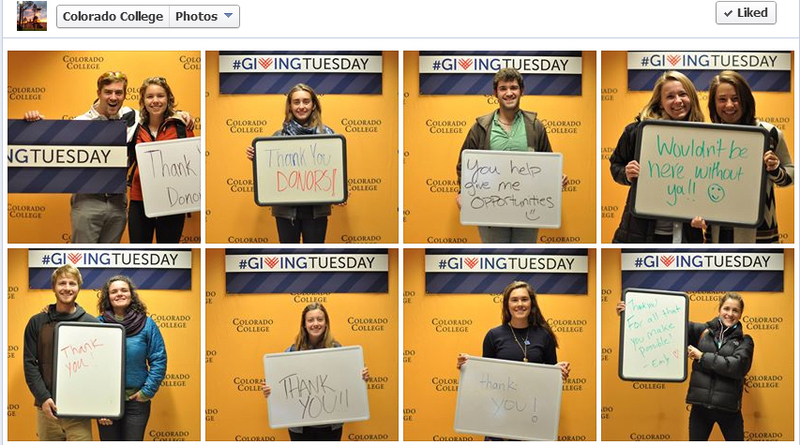 A lot of people still do the old "post a photo and paste the link in the caption" trick - I won't name names, but here's an example of one college doing that from Giving Tuesday - which used to make sense when Facebook's algorithms skewed way heavy toward photos rather than links, but now is an obsolete and less effective way of doing things. The biggest difference is that when you use a custom link image, any click on the photo goes to the external link; when you upload a photo, any click on the photo will pop up the "lightbox" Facebok photoviewer. This can make a huge difference in the number of clicks a link ultimately gets. Repeat after me: If the goal of a particular post is to get people to click an external link, use a custom link image!!! DO NOT post a photo and paste the link in the caption. Whew. I feel better.